Egberts Insurance Agency, a New Jersey-based insurance firm with offices serving central New Jersey and the Philadelphia metropolitan area, is launching a joint charity drive in cooperation with the Gloucester County Habitat For Humanity in an effort to provide affordable homes to underprivileged families. Habitat For Humanity is an internationally recognized non-profit organizations that works to build new homes for families that are underprivileged or underserved. Homes built by Habitat For Humanity are sold at no profit to qualifying families, greatly increasing affordability, and mortgage payments from client families go toward the building of homes for more families in need. 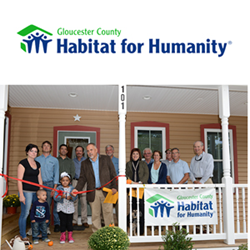 “Habitat For Humanity has done so much good for so many people in our area, and this charity event will provide Gloucester HFH with even more funding to provide for even more families in need,” says Pat Egberts, founder and director of Egberts Insurance Agency. Egberts and her team are utilizing social media and an email update system to gather support from families, business owners, and community leaders in the region. The Egberts team will also be producing a feature article for their online magazine, “Our Hometown,” that will provide details on the Habitat For Humanity charity event: http://www.egbertsinsuranceagency.com/Our-Hometown-Magazine_41. Several other New Jersey charities have received assistance from Egberts Insurance over the past few months. As recent entrants into the national “Agents of Change” community involvement campaign, Egberts Insurance Agency plans to find and support a new local charity every other month. Readers that wish to join Egberts Insurance Agency during the Gloucester County Habitat For Humanity charity event are invited to visit the following page and make an effort to support the cause: http://www.egbertsinsuranceagency.com/Building-Homes-and-Brighter-Futures_25_community_cause. Readers that are interested in learning more about charities and non-profit organizations that have been supported by the Egberts Insurance team in the past can review the firm’s Community Causes listing here: http://www.egbertsinsuranceagency.com/community-cause. Pat Egberts, principal of Egberts Insurance Agency, is a 25 year veteran of the insurance industry. With extensive tenure and experience, Egberts and her team not only understand the ins-and-outs of insurance, but also serve hundreds of families regarding their protection needs. Egberts Insurance can help you protect the things that are important – family, home, car, boat and more. The Egberts team understands the importance of thinking about the “big picture” when it comes to your financial future, and is committed to helping you protect what you have today and prepare for tomorrow. From life insurance to retirement, Egberts Insurance is dedicated to helping you reach your financial goals. To reach a helpful and knowledgeable Egberts representative, call (856) 481-4817 or browse to http://www.egbertsinsuranceagency.com/.